First Club Ride Saturday Apr 2 11AM! The weather is looking great for Saturday so let's get our first club ride done! The idea is to host a formal team ride starting at a north location one weekend and a south location the next. We'll start by splitting the difference and doing the wheelers route. However, this will be a friendly ride, with a more relaxed early-season pace, with the goal of keeping the group together. Anyone feeling inclined to test their indoor training will be free to do so, but expect to wait at strategic points to re-group. Details of the route are here. A stop will be made in Cochrane for coffee and snacks with a short break. Meet at the Tim's at 85th Str and 9th ave SW at 11:00 am sharp, but I'll check my phone for stragglers. I'm looking forward to seeing the regulars and some new faces! Team... there is a 'Speed Theory Current Members' club in Strava. If you are on Strava.. go to Clubs and join it! Here is a direct link to it! Jason Lapierre Memorial Cycling Race meeting last night. We had a good turnout for the meeting last night. Here is a synopsis of what we decided. We would like to make the race desirable to Edmontonians willing to make the trip. So we are going to have the events Saturday late-ish afternoon and Sunday mid-morning. This will concentrate the event to make it easier on volunteers as well. We will make it an Omnium and try to devise a cool point structure that will still appeal to the Crit Specialists who would sometime skip the TT. Make the TT short enough that people can't use its length as an excuse to skip it and wait for the Crit, but make it challenging so that the weekend isn't dominated solely by one type of rider. 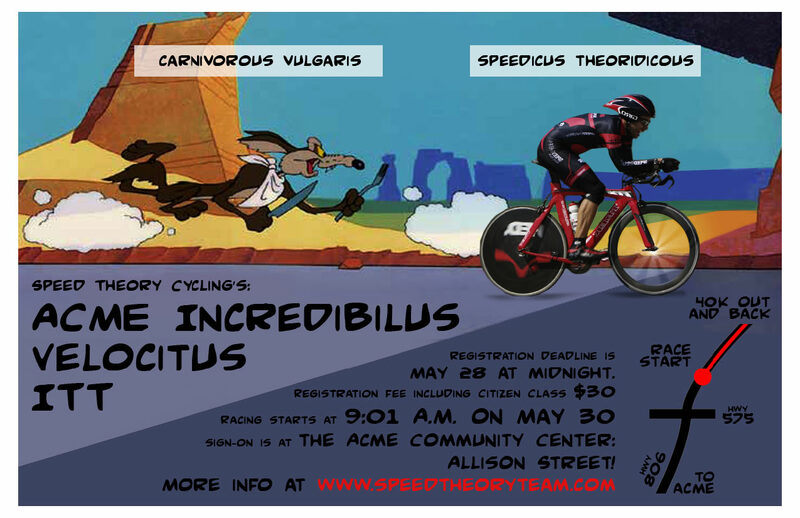 We are going to use our new location for the Criterium since it will be on almost abandoned wide well-maintained roads making it safe and appealing to cyclists wanting to try a first Crit or to experienced racers that usually shy away from Crits. So, pending approval from all the authority figures (Rocky View County, the City, the ABA, etc), here is what we are going to do this year! June 4th late afternoon: 12km TT. Course here. We wanted a challenging course that would make it worthwhile for people to test their pacing and gearing strategies on. June 5th mid-morning: 1.1km Crit. Course here. This course will be a good contrast to something like the Velocity course which contains multiple direction changes and slight elevation changes. This will cater to slightly different skill sets and also appeal to those that may not always enter Crits. We'll keep everyone updated on the approval progress. Stay tuned for the actual daily routes which will be very similar to prior training camps. Note that the longer challenging days will have a shortcut option to ensure everyone is back in Penticton at a reasonable time for dinner. For those who may not want to cook after a long day in the saddle we will also be organizing daily dinner reservations at various local restaurants. Please indicate if you are attending and also indicate if you are interested in sharing accommodations and/or carpooling. *Temporary insurance will be available for guests who are not current members of Speed Theory Cycling. Rob hosted a NW ride on Sat. Make sure to hook up with him next time he posts! STC group rides are already being posted in the Training Forum! Remember, you need to be a current member of our club, or another ABA club to participate in these. You don't need to have your ABA race license. As long as you are a CURRENT member of an ABA affiliated club like ours, you are good. Here is the link to sign up for STC if you have not already. I just got confirmation from Champion System that our order is due to ship the week of March 28th !! Meaning we will get our kit either that week or the next. We we efficient this year!